Pawhuska People – Page 19 – Articles about the People of Pawhuska with uplifting, culturally rich themes. “I want to replicate myself as much as I can. I want to teach people what I’ve done, because I can teach people to do this in their own city,” said Agape’ Mission Director Sherri Smith. 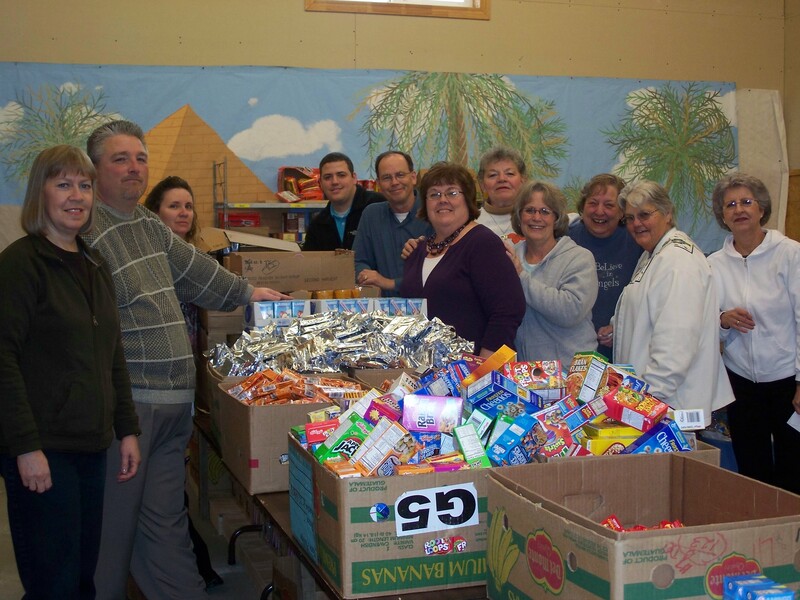 Five years ago, Agape’ Mission Director Sherri Smith, began the Food 4 Kids program to provide food on weekends for public school children in need. 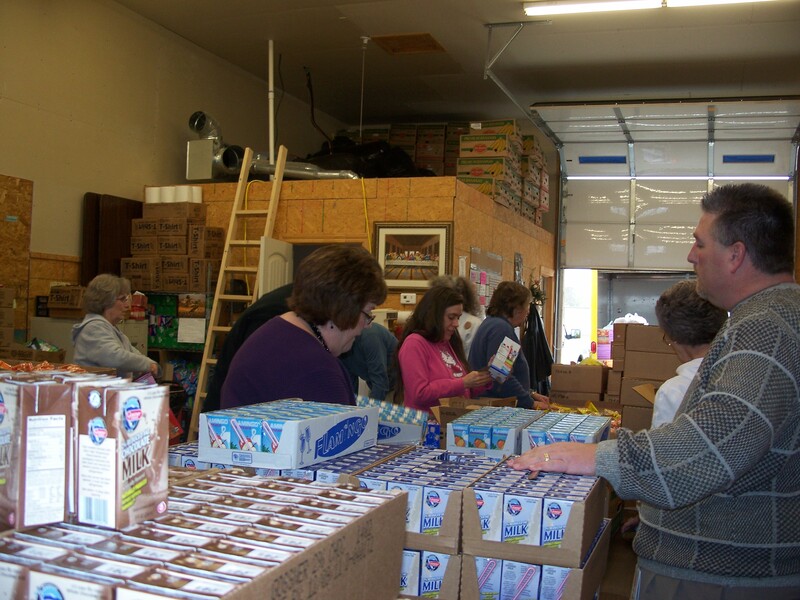 In March 2005, volunteers began assembling about 150 bags of food per week. Over the years, that number has grown to 450 bags per week, serving these public schools located in Washington County: Wilson, Hoover, Mid High, Kane, Central Junior High, Jane Phillips, Oak Park, Caney Valley and Dewey. 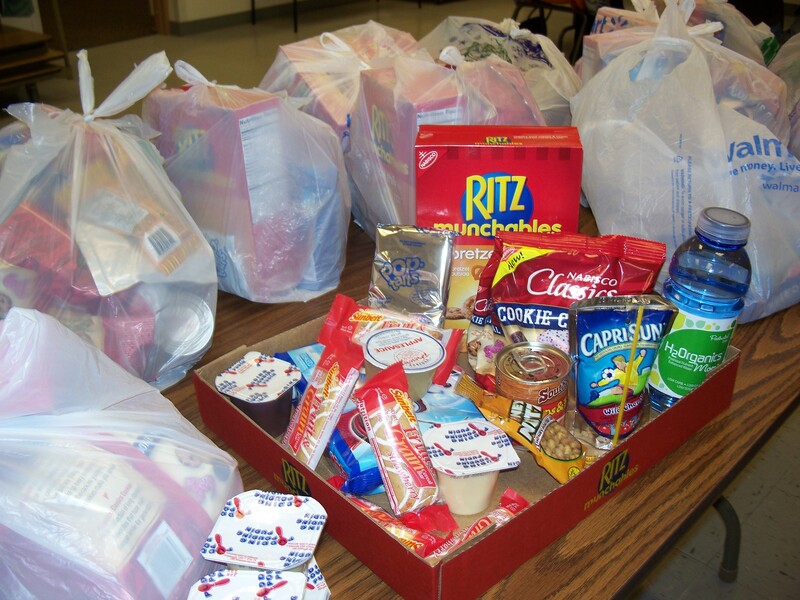 They also provide bags of food for two public schools in Osage County: Osage Hills and Bowring. In a recent interview, Smith shared how she became Director of the Agape’ Mission. The Agape Mission, located at 309 S. Bucy in Bartlesville, had been operated by another organization. Smith was sorry when it closed. 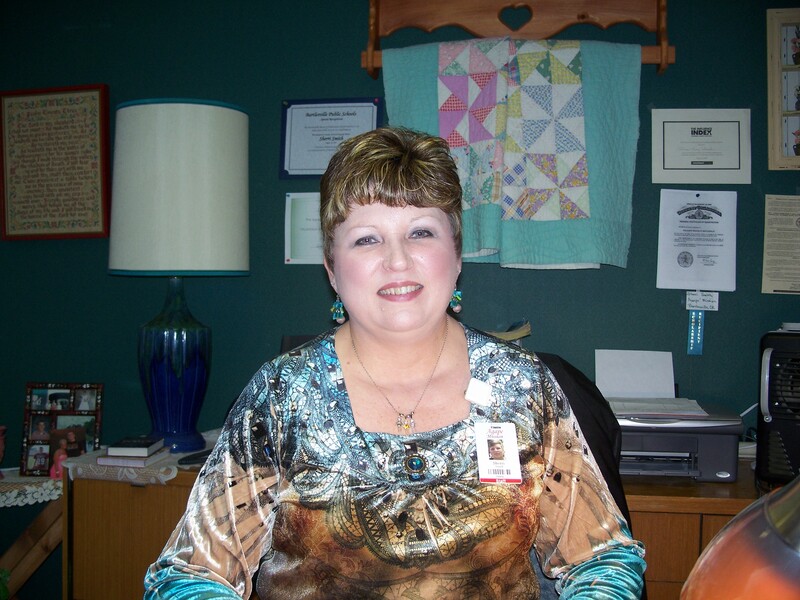 She had been a volunteer in Bartlesville for many years, and knew how needed it was. Her involvement started with conversation she had with her pastor at Bartlesville First Assembly of God. “One Sunday afternoon, we took my pastor out to lunch … and I thought who better to ask than him. By the end of the conversation, it was agreed I’d give a presentation to the church board,” Smith said. The church board agreed to open the Agape’ Mission again and put Smith in charge of it. She had been a commodities broker for the previous eight years. However, believing God had led her to this crossroads, she left her job and agreed to take on this new role. Smith said that the first major victory was that the Mission was able to purchase all the needed kitchen equipment, even silverware, from a closed restaurant in Ramona for $5,000. The church congregation stepped up and provided the needed funds. At that time, Smith cooked the meals as well. After much thought and prayer, at the end of Nov. 2000, Smith scaled back to one meal a day, which the Agape’ Mission still serves six days per week from 11 a.m. to 2 p.m. The Mission is closed on Sunday. “I think we’re the only United Way non-profit in Bartlesville that’s open on Saturday,” Smith said. Two and a half years after opening, the Mission was able to hire a cook, and Smith became the full-time director of the Mission. Because feeding the community is central to the Mission’s purpose, developing the Food 4 Kids program just made sense. The Food 4 Kids program began in March 2005 with volunteer Rissie Soderstrom as its coordinator. Soderstrom organizes a team of seven women, who meet each week at the warehouse and assemble the backpacks during the school year. Agape’ Mission has a truck which then delivers the food to the schools each week. Additional volunteers such as: Church groups, home-school children, ConocoPhillips employees and others pitch in regularly to help. For example, five employees of the CIT Project Services Department at ConocoPhillips volunteer once a month assembling the food sacks. There is a corporate giving program whereby ConocoPhillips gives $500 to Agape’ Mission for every 20 hours of service provided by its employees. As part of her duties, Soderstrom schedules the additional volunteers to help. “If you have a group or even children, they can come in and volunteer,” Soderstrom said. Some of the groups that have helped are: Civic groups, church and youth groups and the Boy Scouts. To arrange for your group to volunteer, Soderstrom may be reached at 918-331-7815. Soderstrom also coordinates the unloading of inventory from the Community Food Bank of Eastern Oklahoma. In addition, she sees to it that double-grocery bags are prepared. God has always provided the volunteers she has needed to help her accomplish these tasks, she said. Each week, the food bags for elementary school students include: One chocolate milk, one regular milk, one pudding (either chocolate or vanilla), one fruit cup, one juice, one Pop-tart or cereal bar, one package of crackers, one package of sunflower or pumpkin seeds, one individual serving of cereal and one raisin box. For students in junior high through high school, the bags include five extra items: Beef jerky, Vienna sausage, macaroni and cheese, one serving of oatmeal and one serving of Ramen Noodles. “We pray over the sacks too,” Soderstrom said. “When the kids come to school on Monday they ask ‘are we going to get our sacks this week?’ Even if the kids are sick, their parents come and get them,” she added. “Our feedback is positive – how it’s helped,” Soderstrom said. “If we help the children when they’re young, they’ll have fewer health problems as adults,” she added. In order to meet community childrens’ summer needs, the Mission will begin a summer Food 4 Kids program on June 4 called Acts in Action in Bartlesville. “We’re going into four quadrants of the community: the Brookhaven area at Girl Scout Park, Oak Park, and near Wilson at the Spruce Baptist Church parking lot,” Smith said. “We’re going to feed them, have prizes and it will be like sidewalk bible school. Everyone has to have background checks – it’s a big deal. Mary Martha’s is also working with us to provide prizes and what we need,” Smith said. “I want to replicate myself as much as I can. I want to teach people what I’ve done because I can teach people to do this in their own city,” Smith said. 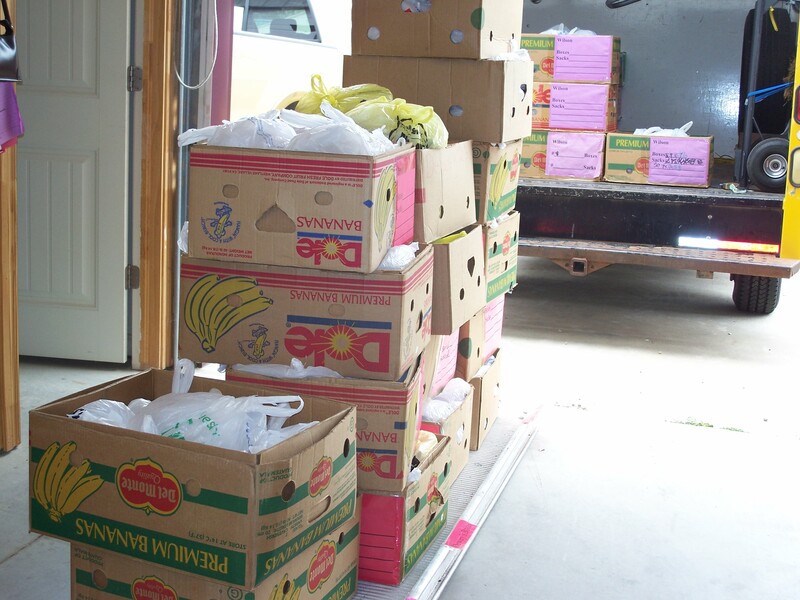 Agape’ Mission accepts food donations. They especially appreciate monetary donations because the food can be purchased in bulk from the Community Food Bank of Eastern Oklahoma so they get more for the money, said Smith. Soderstrom agreed. Donations are tax deductible and can be made payable to Agape’ Mission with Food 4 Kids on the memo line of the check. The mailing address is: P.O. Box 1085, Bartlesville, OK 74005. For more information, Agape’ Mission Director Sherri Smith may be reached at 918-336-5410. Backpacks contain shelf-stable meals, which the children can prepare themselves. Organizers are seeking donations so that a backpack program called “Food 4 Kids” in Pawhuska, which began during 2010 summer school and continues through the end of the school year, will be able to continue. The program provides shelf-stable snacks to 42 children in kindergarten through third grades, who attend Pawhuska Elementary School. Coordinator Kacee Poteet said, “We’re looking for annual sponsorships which will help sustain the program for the entire year, including summer school,” Poteet explained. A recent story on 60 Minutes about childhood hunger in the United States underscored the problem. When children come to school hungry, they cannot concentrate or learn effectively. Plus, hunger hurts. Many children go to the school nurse with pains, which are hunger related, Poteet said. According to Pawhuska Elementary School Principal Beverly Moore, the poverty rate is 77 percent, which is a strong indicator that children in Pawhuska need this program. It costs just $150 for the 40-44 week school year to adopt a child and the donation is tax deductible, Poteet said. Executive Director of the Housing Authority of Osage County, Christi McNeil, wanted to lend her support to the Food 4 Kids project. McNeil provided much-needed space for food storage in the Cedar Ridge safe room closet in a temperature controlled environment, which gives the food a longer shelf life. “Three pallets [of food] fit into the closet of the safe room,” Poteet said. In addition, approximately 20 Cedar Ridge seniors volunteer at the safe room to assemble the bags of food weekly. Poteet and Perrier want the program to continue next year and grow. “We want this to be a program that lasts long after us,” Perrier said. “It just serves kindergarten through third grade now. There are others who ask if there are bags for their older siblings too,” Perrier said. For now, the program only serves four grades, but Perrier and Poteet look forward to a time when this can be expanded to serve grades pre-k through twelve. Donations by civic groups and individuals are welcome. “It would be nice if civic organizations would say they’re going to give a certain amount each year,” Poteet said. “If there’s any way we can continue, we’d like to,” Poteet said. The Backpacks 4 Kids program gets its food at a much lower cost by buying in bulk from the Eastern Food Bank of Oklahoma at their on-line website, Poteet said. 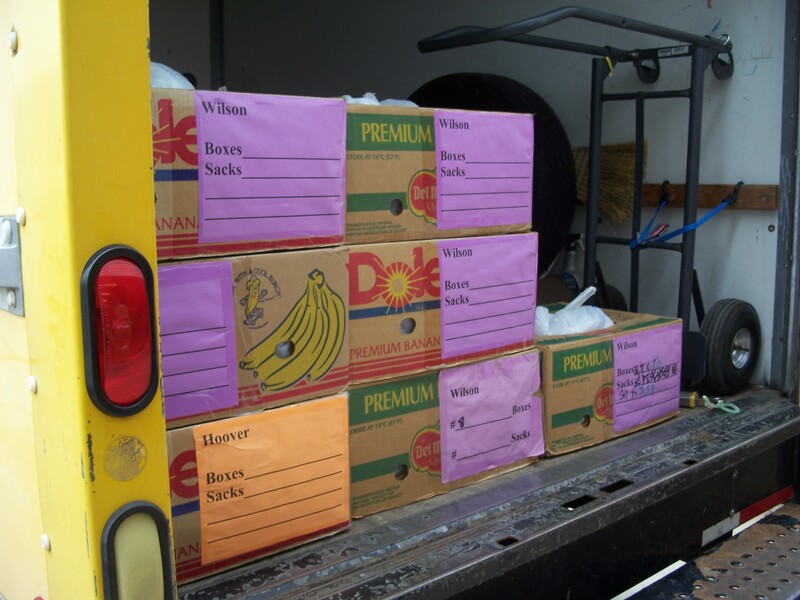 In fact, some items are offered free from the food bank, including fresh fruit. The program provides non-perishable food items, which the children can prepare themselves. 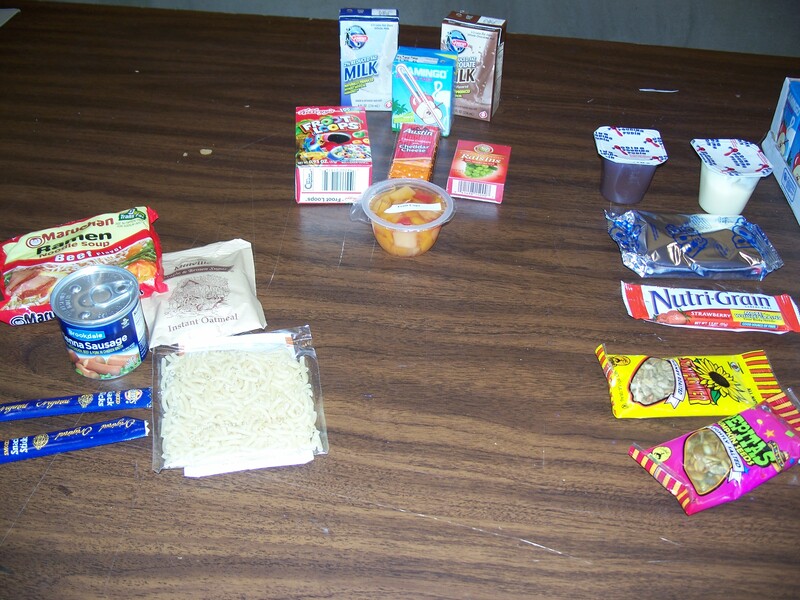 The food items include things like: pudding cups, raisins, beans and franks in pop-top cans, cereal in individual servings and juice boxes. Peanut products are not used due to the risk of allergies. Students participating in the program are told they have won a prize in a drawing and are given drawstring backpacks, which on Fridays were filled with food to last through the weekend. On the Friday before spring break, the students were given double portions of food in their backpacks to help over the week-long holiday. If the children forget the backpacks, they still get the food in plastic grocery-style bags. Parents are notified in writing, and are able to opt out if they do not want the food for their children. Children are chosen to be included in the program based on information from various public agencies, which serve low-income families, such as Department of Human Services and TANF (Temporary Assistance for Needy Families). The Edwin Fair Community Mental Health Clinic receives the donations on behalf of the Food 4 Kids program because it is set up as a non-profit 501c(3) program, Poteet explained. Donations are made payable to Edwin Fair with “Food 4 Kids program” listed on the memo line of the check, and may be sent to: 124 E. 6th Street, Pawhuska, OK 74056. Recently, the Pawhuska Elementary School began accepting the donations on behalf of Edwin Fair. For more information about donating or volunteering, call Kacee Poteet at 918-287-5266. This number accepts voice messages. Look for another story, coming soon, about Agape’ Mission’s Food 4 Kids program in Bartlesville, now in its fifth year. 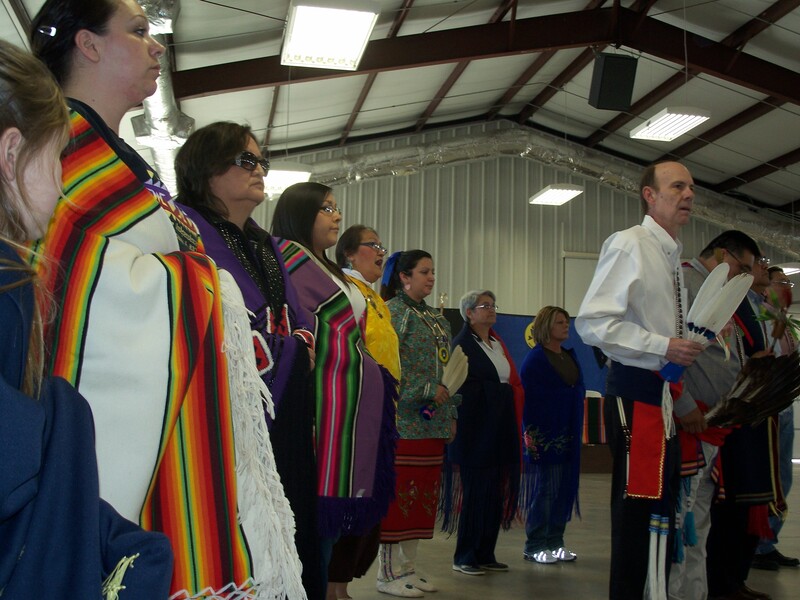 On March 11, 2011, the Osage Nation held its fifth annual Sovereignty Day celebration at the Agriculture (Ag) Building at the Osage County Fairgrounds. Traditional gourd dancing began shortly after 2 p.m.
Gourd dancer John F. Johnston, known to many as Sandy Johnston, spoke as he prepared for the afternoon’s dance. In the center of the room was a large drum with chairs circling it. Around this was open floor space for the dancers. The outer perimeter of the room had groupings of several rows of chairs facing the center of the room. Various Osage Nation department and organizations had booths set up along the walls of the Ag building including: the Osage Million Dollar Elm Casino, Osage CASA program, which trains volunteers to be advocates for children going through the court system, and the Osage Nation Education Public School Support Program. The emcees for the afternoon were Osage Congressman Archie Mason and John Henry Mashunkashey, who announced upcoming Osage cultural events during breaks in the gourd dancing. Johnston sat on the front row, facing the center of the room. He explained that after having grown up in Pawhuska, he moved to Parsons, Kan., and then Coffeeville, where he had made his living as a butcher and meat cutter for over 30 years. Now single and retired for five years, Johnston has three grown children – two daughters and a son. One daughter and the son participate in Osage traditional dances, he said. 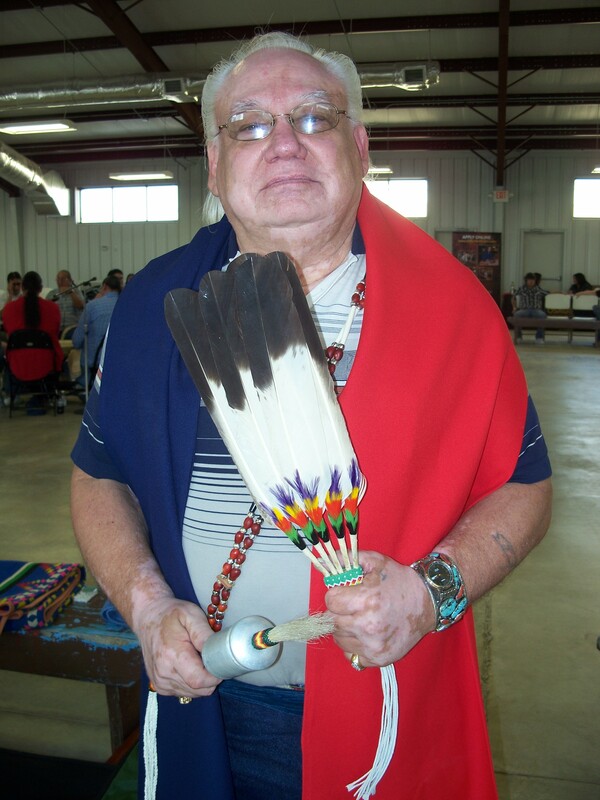 Johnston’s son has just recently begun to return to the Osage traditions, he added. Johnston said that his biological mother, Beatrice Hunter, and his adoptive mother, Marian Coshehe, were both full-blood Osage. A bench in front of Johnston held a cedar chest. Johnston opened the chest and from it took his wardrobe accessories for the dance. First he tied a navy cloth sash around his waist. The ends of the sash, which were aqua, hung from his right hip to below his knee. Next he added a bandolier, which he placed over his left shoulder and diagonally across his chest, which were fastened with a silver disc at his right hip. 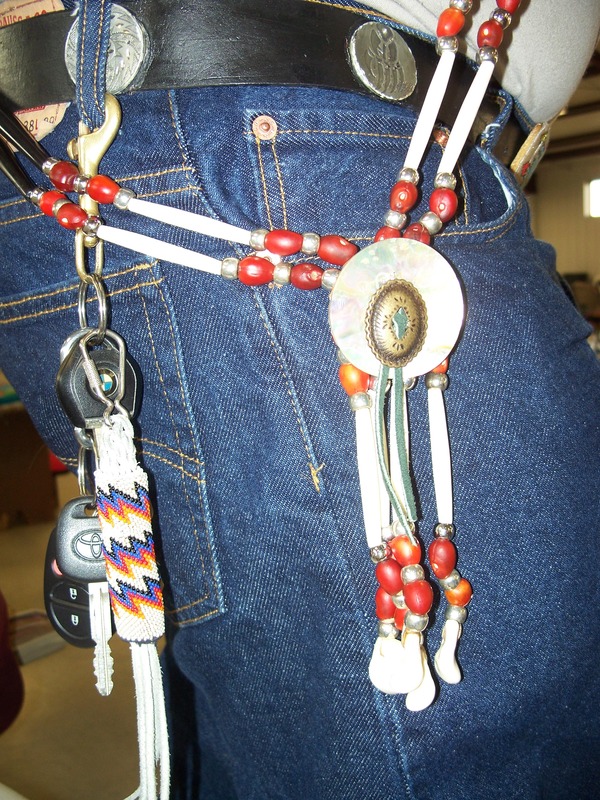 The bandolier consisted of two strands of decorative beads – red peyote beads, silver beads, longer cylindrical beads of real cattle horn and brown rectangular leather spacers. “At traditional dances you wear two strands of bandoliers,” Johnston explained. Johnston then placed a long cloth shawl around his shoulders. One half of the shawl was navy and the other half was red. “The red side is always worn over the heart,” Johnston said. From the cedar box, Johnston took a silver shaker on a wooden staff with cotton strands at the bottom and embellished at the top with aqua and red beading and pale horse hair, which he held in his right hand. In his left hand, Johnston held a cluster of five eagle feathers bound at the bottom with decorative multicolored beading. The feather quills were painted in bands of bright colors — yellow, red, green and black. Below this were cotton strands. Soon, the Osage performers began their song with the all-male circle seated and striking the drum at once. A group of Osage women sat in chairs behind the Osage performers in a semi-circle. “The women are behind the men; this is traditional,” Johnston said. The gentlemen gourd dancers moved from their seats to the outer rim of floor space and began to shake the gourds and move their feet solemnly to the beat of the drum. They often stood in groups of two during the dance. Across the room, several female gourd dancers participated. At times during the dance, male and female gourd dancers formed two large semi-circles behind the seated Osage performers and danced. As the song continued, the drum and the voices became louder and faster. Some Osage participants had closed eyes and focused expressions. During the afternoon, Osage Principal Chief John D. Red Eagle and Assistant Principal Chief Scott Bighorse also participated in the gourd dancing. 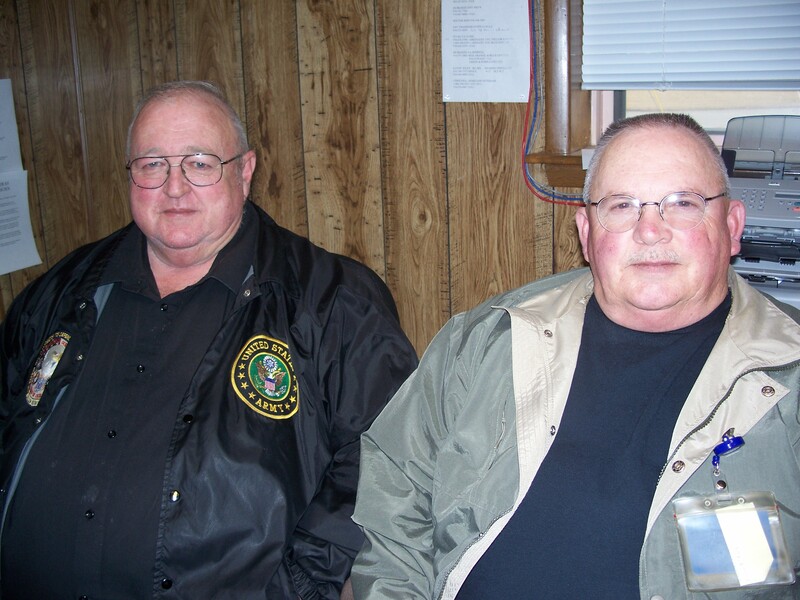 There were many more in attendance, but these are some of those who spoke to Pawhuska Community News. Event organizer Otto Hamilton attended with his wife Geneva and twin sons. Osage Attorney General Jeff Jones attended with his wife, daughter, newborn grandson and two-year-old granddaughter. Osage Minerals Councilman Myron Red Eagle was one of the Osage performers seated at the drum. 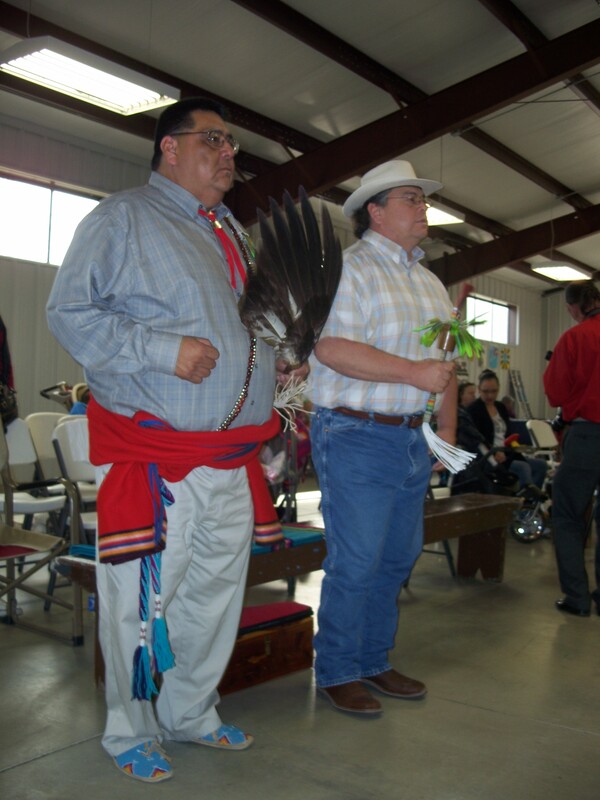 Cultural Center Director Vann Bighorse participated in the gourd dancing. Shortly after 5 p.m., servers began to place the evening supper serving dishes onto buffet tables. “I don’t get to dance as much as much as I’d like to, but I started learning about my heritage again about 15 or 20 years ago,” Johnston said as he carefully placed his bandolier, gourd shaker, sash and eagle feathers back into the cedar chest. Chief Red Eagle prayed over the meal in the Osage language and then prayed in English as well. 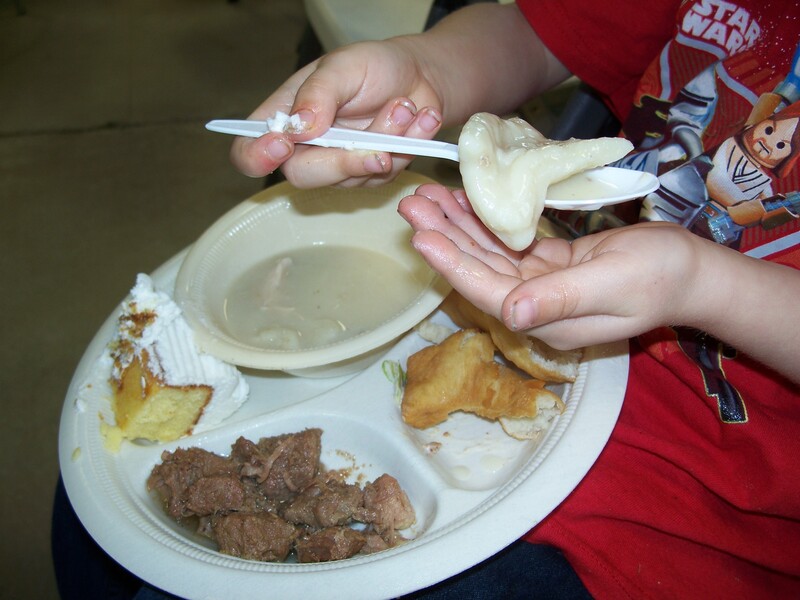 The meal, which had several traditional Osage dishes, consisted of: steam fry, which was made of pork, fry bread, chicken and dumplings, salad, chocolate or white cake and iced tea. When supper was finished, Johnston, who said he was pleased to have been able to participate in the dance, said he was going to head back to Coffeeville before nightfall. The celebration continued into the evening with more gourd dancing at 6 p.m., a Grand Entry at 7 p.m. and a Pow Wow. Although the gourd dancing and Pow Wow are open to the public, the traditional dances held during the summer in Pawhuska are by invitation only, and are not to be photographed because they are spiritual in nature. “It is very spiritual because it’s the closest you are to your creator, Wah-Kon-Tah,” Johnston said. Bandolier Closeup -- worn by John F. "Sandy" Johnston. Short Fitness Center in Pawuska has exercise equipment and a heated pool. Memberships start for as little as $20 per month! The Short Fitness Center in Pawhuska, owned by the City of Pawhuska, is open from 6:30 a.m. to 5 p.m. weekdays for those 18 and older to help Pawhuskans get in shape! Manager Matt Tonubbee, who is a NESTA (National Exercise and Sports Trainer Association) certified trainer, has been working in the field since 1994, and has been on staff since 2003. His hours are 6:30 a.m. to 3:30 p.m. weekdays. His Assistant Manager Diane Todd is at the Center 9 a.m. to 5 p.m. weekdays. The Center, which is open to the public, costs just $20 per month for equipment room, or indoor pool privileges, or $30 for both. Tonubbee and Todd are available to help members achieve their fitness goals. “When people join, we show them how to use everything in here. If they want more specifics about what to do, they come to me,” Tonubbee said. The equipment room has a variety of machines for cardiovascular training including: Two treadmills, two Schwinn Airdyne bicycles, two eliptical machines, two Nu-Steps (sit-down steppers) and one stair climber. For strength training there are: a large, multi-station Yukon machine and a Bowflex machine. The equipment is set up facing a large, flat-scree television, which provides entertainment while members exercise. “The television is available on a first-come, first-serve basis as long as the station chosen doesn’t offend anyone,” Tonubbee explained. The Center shares its restroom/shower with the outdoor city pool facility. The restrooms are heated and the temperatures in those areas are comfortable except on the coldest days, Tonubbee said. Although the Center does not have lockers, the pool area does have baskets to hold personal items. Members are responsible for safekeeping items they bring on premises. In the pool area, which is heated at 85 degrees, there are dumbbells and barbells for strength training. Inside the pool is a self-propelled treadmill. The pool is not a lap-style, but there are times during the day when traffic is slow enough that people can do laps, Tonubbee said. The pool’s depth ranges from 3.5 feet in the shallow end to 4.5 feet in the deep end. The pool offers a way to exercise muscles with reduced strain on joints. “The clientelle that uses our pool typically have lower extremity issues whether it be arthiritis or joint pain,” Tonubbee explained. Previously, the Short Fitness Center was owned and operated by the Pawhuska Hospital. However, to conserve the hospital’s budget, the ownership and operation of the Center was turned over to the city of Pawhuska on July 1, 2005. The Pawhuska Hospital continues to provide acquatic physical therapy at the indoor pool as part of its services to patients of its Physical Therapy Department. The Center does not offer acquatic or floor exercise classes currently, but would if there were enough interest, Tonubbee said. Membership is offered on a month-to-month basis or at a daily rate of $5, so members can try out the facilities without making a long-term financial commitment. The Center has 65-70 members currently and is taking new members. In addition, there are key cards, which provide 24-hour access to the Center. All of the 190 key cards have been issued at present, but members can be placed on a key-card waiting list. Tonubbee routinely requests the return of key cards not being used, so they can be made available to other members, he said. City of Pawhuska employees receive free memberships and key cards, while family members pay the regular membership fees. The Center offers a peaceful, friendly atmosphere in which to get in shape. “A large portion of the clientelle are over 50,” Tonubbee said. However, “We’ve started getting younger people in the past ten years,” he added. The Center is open to the public 18 and older. For more information stop by the Center or call 918-287-1681. The General Federation of Women’s Clubs (GFWC) – Heeko Club in Pawhuska celebrated 100 years on Feb. 14. Member and current GFWC Oklahoma President Joyce Ward recently spoke to the local Kiwanis Club about the purposes of this service organization and high moments of the GFWC – Heeko Club. The Pawhuska gets its name “Heeko” from the Osage word for learning. To understand the GFWC, one must be introduced to its founder, Jane Cunningham Croly. Croly’s family emigrated to the United States from England and settled in New York. In 1856 she married a journalist named David G. Croly, who as an editor is credited with originating the format of the modern Sunday newspaper. In 1857 Jane Croly’s popular column became one of the first syndicated columns written by a woman. Croly’s decision to form a women’s group stemmed from her being denied admittance to an 1868 press club dinner honoring novelist Charles Dickens. After this unpleasant experience, she formed a club called Sorosis, which is a Greek word meaning “an aggregation; a sweet flavor of many fruits.” Croly invited women’s clubs throughout the United States to attend a ratification convention in New York City in April 1890. Sixty-three clubs attended and formed the General Federation of Women’s Clubs. Perhaps because it was founded as a federation of women’s clubs, GFWC’s mission is broad. GFWC projects tackle many social issues. Now an international organization, GFWC has had its hand in so many different projects that it would be difficult to list them all. Here are just a few of the U.S. projects: creation of responsible child labor laws, creation of fair laws for juvenile courts, the establishment of public libraries, support of the Pure Food and Drug Act, efforts to limit the workday to eight hours, assistance to soldiers wounded in war, the Indian Welfare Committee for disenfranchised Native Americans, education on home economics such as canning and storing food during periods of economic hardship, the Equal Rights Amendment, selling war bonds during WW II (which funded the purchase of 431 U.S. war planes), the seat-belt campaign, youth suicide prevention, a crime reduction program called “Hands Up,” the “Brighten the Night” campaign to bring street lights to communities, and programs to end domestic violence. To learn more about GFWC and Croly’s remarkable life, visit the GFWC website GFWC.org. To say that the Heeko club is involved is an understatement. The efforts of the GFWC – Heeko Club have changed the face of Pawhuska. The GFWC – Heeko Club in Pawhuska spearheaded the effort to establish the Osage County Historical Society Museum, the Pawhuska Hospital, the Senior Center and the Step-on Pawhuska tour, to name a few. GFWC is a generational tradition in Joyce Ward’s family, as it is for many members. Her mother, Rose Downey of Pawhuska, was president of the Heeko Club in 1966 when the GFWC – Heeko Club won a prestigious award — first place in the GFWC International Community Service Award, which awarded the Heeko Club a $10,000 prize. The Heeko Club won the honor based on their two-year service project (1964-1966) called “Pride in Pawhuska.” This project focused on the Osage County Historical Society Museum, the founding of “Heritage Week” in Pawhuska and free vision and auditory testing for elementary school-aged children. Most of the funds from this award were donated to the effort to convert the old Santa Fe Railroad train station depot into the Osage County Historical Society Museum, Ward said. In 1962-1964, the GFWC – Heeko Club’s service project called “Boom Pawhuska” won fourth place and $1,000 for its efforts to improve Pawhuska. 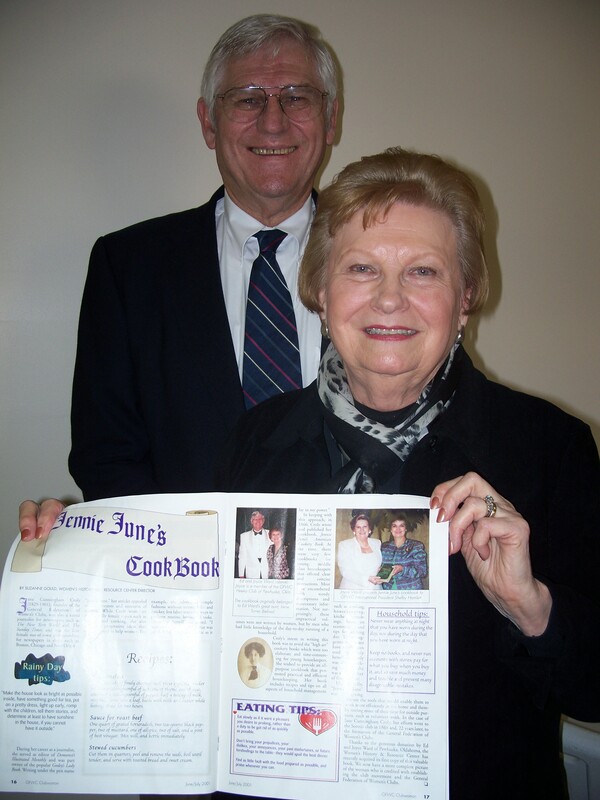 Joyce Ward and her husband, Ed Ward, showed a copy of a 2001 GFWC magazine “Club Woman” article about their donation of a one-of-a-kind cookbook by the GFWC founder to the GFWC headquarters. Ed Ward explained that he had inherited the books from his mother. When he was going through the books, he found this Jennie June cookbook. Joyce Ward was delighted to find this single-edition cookbook, which had been published in 1867, in her possession. Ed Ward said they had had the cookbook appraised, and learned that it was quite valuable. Nonetheless, the couple decided to donate the cookbook in 2001 to the GFWC headquarters in Washington, D.C.
She went to visit the cookbook after the donation at the GFWC headquarters and was moved by the care with which it was being preserved. “It was very emotional – like seeing your child,” Joyce Ward said. Wearing white gloves, “[t]hey went up the ladder and pulled it out and showed it to me … That was the only copy they could ever find. Her family didn’t even know she had written one,” Joyce Ward said. Joyce Ward is currently Oklahoma President of GFWC. Her two-year state project is to assemble school supplies donated by GFWC clubs throughout the state and deliver them to school children in Afghanistan. The first shipment of 240 backpacks, and additional supplies for teachers, shipped out with the Oklahoma National Guard when they left for Afghanistan recently. For more information about Oklahoma GFWC and donating school supplies to this cause, visit their website at www.gfwc-ok.com. I am a late bloomer who found my passions later in life. When I looked at my child for the first time, I knew I had found my first passion. I thought my passion list was complete until I began writing about Pawhuska and its people. I have a B.A. in Journalism from the University of North Carolina at Chapel Hill. I moved to Oklahoma in 1996 and lived in the Tulsa area for a decade before moving north, where I found Pawhuska in 2010 and worked briefly for the Pawhuska Journal-Capital. I was recruited to work for the Osage Nation, where I worked from 2011-2014. In March 2014, I started McKee PR Advertising & Design and I continued my journalistic efforts at this website and on the Facebook page by the same name. I prefer feature writing to hard news, so I leave those journalistic efforts to others. The features published here generally have uplifting, culturally rich themes — celebrations of the magic that is Pawhuska!